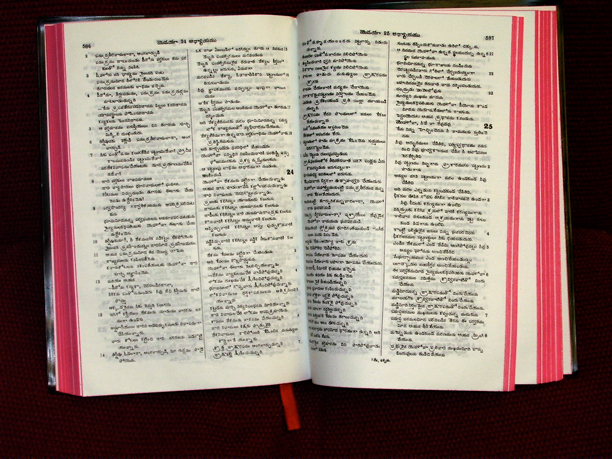 Book of Edward Volumes Chapters are offered for a focused Bible study lesson. Digital download links are emailed to purchaser upon completion of purchase. Digital download links are only active for 48 hours. Download immediately. There are no passwords to view the digital download files making them easy to use. All products have a 30-Day Money Back Guarantee. Digital downloads are in Acrobat PDF form. User must have Adobe Acrobat Reader 5.0 or later installed or equivalent. If you experience trouble with any digital download, please use our feedback form to contact us for prompt assistance with the download. If you plan to use your PayPal account for payment, select the PayPal option at Check Out. For every $5.00 Bible donation, Apostle Ministries will be able to place one Telugu Bible into an India family's home. A ground team of ministers in India is supported by Apostle Ministry to deliver and minister to families in India. These are places where the word of God is seldom heard. Often, it means placing a Bible into the hands of a Hindu family for their study. You can play a role in getting the word of God out so poor families in India can learn about the great love God has for HIS people. A love so great, that HE gave us the sacrifice of HIS only human begotten Son -- "That whosover believes." Well, you know the rest. PLEASE help us to get God's Word and the teachings of Jesus distributed in India. God will bless you greatly for helping Apostle Ministry distribute God's Holy word in India. You can also make a donation directly to the ministry to help us get the truth of God's Holy Word back into the Christian Church.